Yesterday I posted about General Turning Insert Nomenclature . I have used multiple turning insert in the cnc workshop. With the passage of time in the cnc workshop the turning insert which I used most or you might say that the general turning insert which can be used for most of the lathe machine operations is DNMG Turning Insert . I personally like DNMG 150616, because this insert is solid (6 mm insert height) and is with a bigger radius of 1.6mm. Another plus point of DNMG type turning insert is its shape it is a D shape turning insert, meaning that it is a perfect choice for grooving and long profile turning. 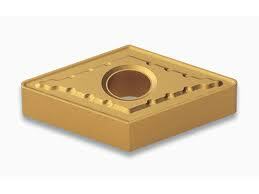 When we come to grooving there are multiple choices like DCMT turning insert, and VBMM turning insert. If I compare VBMM 160404 and DNMG 110404. I will prefer DNMG 110404 because of it’s solid shape as long as the insert angle of DNMG which is 55° don’t restrict me. But sometimes DNMG loses the game against VBMM when the groove is too narrow and deep.